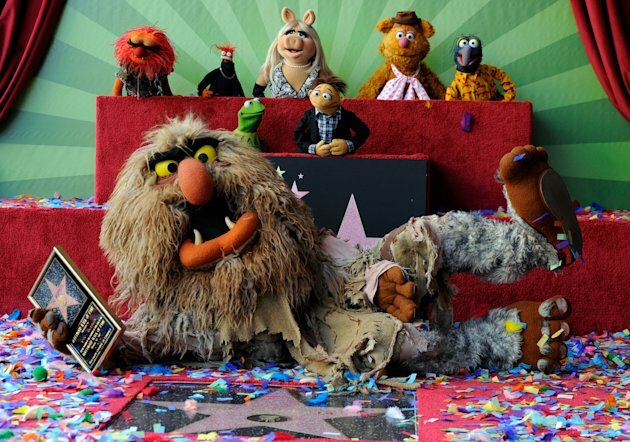 On March 20, the first day of spring, The Muppets received the 2466th star on Hollywood’s Walk of Fame. The cast, which has charmed TV and movie viewers for 50 years, now joins a select group of “fictional” stars, which includes Mickey Mouse, Godzilla, Shrek, and The Simpsons. Miss Piggy pointed out during the news conference, however, that all movie stars are fictional. Lisa Henson, CEO of Jim Henson Enterprises remarked that The Muppet’s star, in front of the El Capitan Theater, is very close to her father’s. Henson created Muppet prototypes in 1955, for a show called Sam and Friends, which ran for six years on WRC-TV in Washington, DC. Jim and Jane Henson with the cast of "Sam and Friends"
Henson died in 1990, at the age of 53, of complications from a severe strep throat infection. Associates and family say he was so busy working, he didn’t seek medical help until it was too late. During the last year of his life, Henson negotiated to sell the Muppets to Disney. The sale was finalized in 2004. The latest Muppet movie was released to DVD yesterday too, a seemingly successful effort to revitalize the cast and introduce Walter, a new character, who was present at the dedication ceremony. Kermit received his own Walk of Fame star in 2002, but Henson’s little frog would be the first to say The Muppets are a group effort. The group finally has the recognition it deserves. This entry was posted in art, Characters, Culture, Movies and tagged 2012, art, Culture, fantasy, fictional characters, imagination, movies. Bookmark the permalink. The Muppets are one of the best and most creative ideas “made in America.” Thanks for giving them their due. I fully agree with you, and with Walter, who said in the last movie, “As long as there are muppets, for me there’s still hope.” If you search on “Muppets” here, you’ll find two other posts that relate to the movie. Jim Henson has always been one of my hero’s, and I came on a neat little tidbit while researching this post. George Lucas originally asked Henson to do Yoda. Henson was busy with other projects, so Yoda fell to long time Muppet associate, Frank Oz. Yoda comes off as so real, I had never thought about the mechanics. So sad when Jim Henson died…. I know. I saw a note on Henson’s Wikipedia page, dated 2010 that the first biography, sanctioned by Henson’s family was “underway,” but I haven’t heard anything more about it. What an amazing font of creativity he was in his far too-short life.